Exclusive breastfeeding could make a child dehydrated, so a baby needs water: Breast milk is said to be about 88% water, especially the first milk that comes out in each feeding session. Thus, breast milk contains as much water as a baby below 6 months of age needs. Babies on EBF should simply be offered breast milk when it is suspected that they are thirsty. Giving water to babies comes with a lot of concerns especially in our part of the world where safe, drinking water is hardly assured. 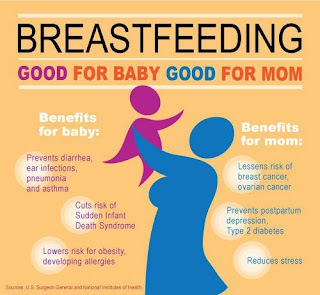 EBF is stressful: Motherhood and all it entails can be really stressful but when it comes to ranking stressful activities, putting a baby to one's breasts for feeding can hardly be compared to preparing formula (or in fact any other baby food) as the latter is much more stressful. Exclusive breastfeeding must last up to 6 months.While six months is the standard length of time for practising EBF, it is nowhere etched in stone that it must last that long. Many Pediatricians recommend 6 months as the maximum length of time and 4 months the minimum. That is, complementary feeding can be introduced when a baby is four months of age, but not before then if the mother for one reason or the other feels there is need to do so. Some babies start showing interest in other foods before 6 months, some pediatricians recommend such babies should be introduced to other foods to sustain their interest in foods besides breast milk. You need to drink milk/tea always to keep up your milk supply: There is absolutely no scientific evidence to back this up. In fact, milk and other dairy products are linked to infant gas pain. EBF mums should simply take enough water to keep themselves hydrated. Not every woman can produce enough milk to EBF: Research suggests that above 90% of women can produce enough milk to exclusively breastfeed an infant. Milk supply can only be affected when the mother does not eat well or when she doesn't frequently put the baby to her breasts. Breast milk alone does not sustain some babies below 6 months: Breast milk is more than enough to satisfy any baby aged 6 months and below. Giving a baby that young any other thing is unnecessary at best and very risky at worst as it could expose your baby to contaminants in food and water at that vulnerable stage of your baby's life. Exclusively breastfed babies tend to be picky-eaters once weaned. This is absolutely untrue and has been proven so. Picky eating is a trait found in many babies both mix-fed and exclusively breastfed. Exclusive breastfeeding is only for mums who cannot afford quality formula or those who cannot assure the safety of their drinking water. This is also absolutely untrue. EBF is for every woman who knows its advantages and can practice it; rich and poor alike. Making a case for exclusive breastfeeding.